Do you like keeping up with the latest news and updates from Adobe? 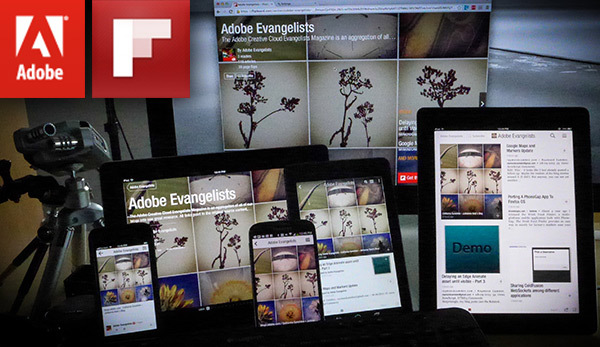 Do you like reading the latest posts and articles from all of the Adobe Evangelists? Do you like seeing featured/highlighted content from Adobe? Do you like reading your content on Flipboard? If you answered yes to any of these, you should really check out the Adobe Evangelists Magazine on Flipboard! The Adobe Evangelists Magazine is a manually curated aggregation of all of our blogs, plus articles and posts that we find interesting and applicable, all combined into one great resource. All links point to the original source content, not a copy. The intent is to provide a one-stop-shop for Adobe Evangelists goodness. You can read it on the web, or on your favorite mobile device. Check it out here and get started! Check it out here and get started!